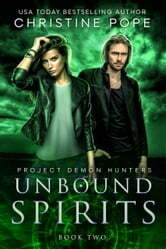 And the story continues in Christine Pope’s “Unbound Spirits” the next book in her series Project Demon Hunters #2. We find Michael Covenant waiting for Audrey Barrett’s arrival in Tucson Arizona to film the second episode of Project Demon Hunters. But Audrey never arrives and can’t be found at the airport or anywhere else. What entails is a fast pace story of two amazing and strong-willed people fighting against an evil demon like no other. Their strength and sense of right and wrong makes it even more interesting as they move on to the next case that brings chills up your spine. Christine has well developed characters and an enthralling plot, full of action, emotions and adventure. Although we are left with a cliff hanger, it is very worth reading this one and the first book in the series. Both have left me very excited for the next book. Can Audrey and Michael team up with the Winchester brothers? Unbound Spirits is the sequel to Unquiet Souls. The story picks up immediately after the end of the first one and we are on another adventure. Audrey and Michael get caught up in more danger as they deal with the aftermath of their last ghostly encounter. Action packed with drama and romance, this is a good read. This isn’t my cup of tea in terms of Pope’s work and genre, but it is a wonderful story. I recommend this to anyone who is a fan of Supernatural or ghost stories. This is a creepy story that leaves chills running down the spine and goosebumps on your arms. I did receive an ARC.